Coming soon: The most inclusive reader's catalog in the world, at your fingertips. 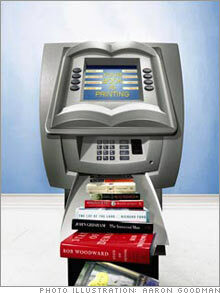 (FSB Magazine) -- Buying a book could become as easy as buying a pack of gum. After several years in development, the Espresso - a $50,000 vending machine with a conceivably infinite library - is nearly consumer-ready and will debut in ten to 25 libraries and bookstores in 2007. The New York Public Library is scheduled to receive its machine in February. The company behind the Espresso is called On Demand Books, founded by legendary book editor Jason Epstein, 78, and Dane Neller, 56, but the technology was developed six years ago by Jeff Marsh, who is a technology advisor for New York City-based ODB (ondemandbooks.com). The machine can print, align, mill, glue and bind two books simultaneously in less than seven minutes, including full-color laminated covers. It prints in any language and will even accommodate right-to-left texts by putting the spine on the right. The upper page limit is 550 pages, though by tweaking the page thickness and type size, you could get a copy of War and Peace (albeit tough to read) if you wanted. Some 2.5 million books are now available - about one million in English and no longer under copyright protection. On Demand accesses the volumes through Google and the Open Content Alliance, among other sources. Neller predicts that within about five years On Demand Books will be able to reproduce every volume ever printed. Epstein says that the larger obstacles are consumer preference - the machine can't make you a latte - and convincing skeptics in the industry. But some early adopters are already sold on the idea. Niko Pfund, a publisher at Oxford University Press, says the evolution away from traditional bookstores is only natural. "For hundreds of years the industry was unchanged," Pfund says. "Then audio came out. Now it's time for digital."